The most famous tourist attraction in Flores Island is in Kelimutu. three colored lakes in Ende District.These colored lakes change colors late 2004 were said to be turquoise,brown and black. 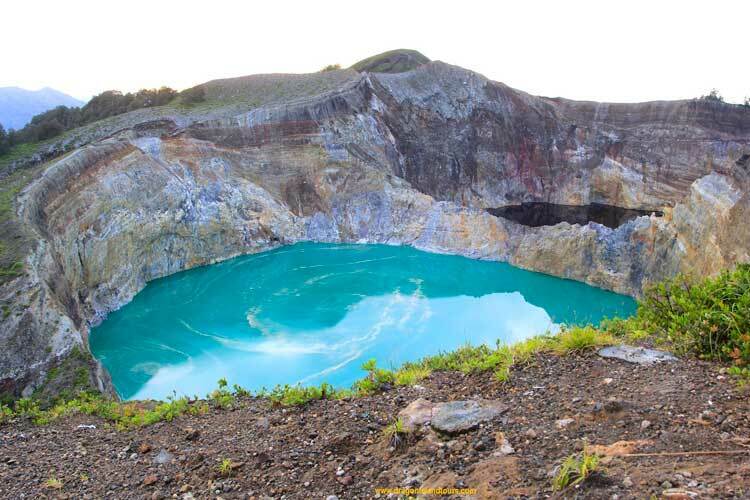 Kelimutu is small but well known Indonesiaan Volcano in central Flores island with three summit crate lakes of varying Colors. Pick up from airport in Ende, drive to Saga Traditional Village from Lio Tribe, it is one of the traditional villages in Detusoko, Ende District.Saga’s community themselves is a part of Lio Trbes which also inhabit the Village of Moni, Near Kelimutu tri colored lake. Afterward drive to Moni Village takes about 1.5 hours on winding roads pssing beautiful mountainous countryside and small villages. Between Ende and Moni you can see beautiful rice terraces. Accommodation in a Bungalow in Kelimutu Eco Lodge which is remote located surrounded by beautiful nature just outside the Moni Village. Wake up early morning and after a cup of tea or coffee,drive in a comfortable air – conditioned private car with driver to the mountainous area passing small traditional village,upan arrival at Kelimutu National Park walk from parking area for 1,5 km and then ascend 127 steps to the lookout at Kelimutu,at an altitude of 1690 meters above sea level.from here you can enjoy superb views of tri volcanic crater.the terrain surroundings the lakes is spectacular,rugged and varied, and in this setting the colors of the three lakes are nothing less than astonishing.No one has managed to explain the cause of the colors or they Change.From Kelimutu, Drive downward to Moni passing beautiful Rice fields and jungle forest.After breakfast we drive to Maumere passing Sikka Village on the south of Flores Island.This Village is famous for the traditional Ikat – weaving and the Old Church, dating from the end of 19 century.You will stop at lovely Paga Beach for short relax and Wolowaru Village. It is also possible to have Lunch o Paga Beach or in Local restourat in Wolowaru than we continue our journey to maumere. Dinner and overnight at Sea world Club Resort.